The festivities are all around us. Why can’t the dog dress up as well? 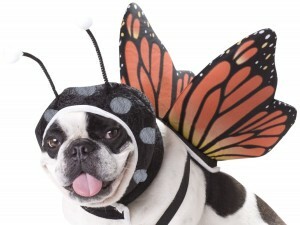 In this list, I am going to point out the 10 best dog costumes that will treat your pup just right. So, whether, you prefer something humorous or just something wonderful for your dog to wear, these is something here for you on this list. So, your dog doesn’t like wearing costumes? Or your dog just not used to the idea. Here is a perfect middle ground for you and your dog. A Bandana! This fits around the collar area and soon the dog will even forget that he is even wearing it. It is a black bandana with white lettering. It is sure to stand out from all the rest. This for the family that has multiple dogs. Sometimes, you have to get creative! For all those Dr. Suess involved. Welcome this time-honored classic with Thing 1 and Thing 2 bandanas. These are a classic touch to the costume solutions and then use it for advertising a special reading time at the local library or the dog parade. If the Force works strongly in your family, your dog should join the team. 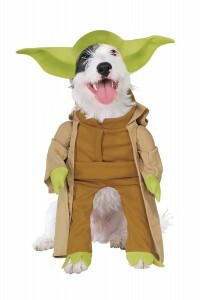 This Yoda costume if the one for your dog. This fits on like a shirt but adds a few extra limbs to your dog as well as the world famous Yoda ears. It is machine washable and cuddle for years to come. Give your dog wings to fly. Like the bandanas earlier, sometimes you need to introduce the idea of costumes over time. This is another perfect way to do so. What you get with this package is a pair of foam Monarch Butterfly wings and a butterfly antenna hat. The wing attach around the shoulders while the hat ties around the dog’s face. Keep this one handy for dress-up activities with the kids or for days at the park. Any dog can wear this hot dog costume, not just wiener dogs. There are two varieties. One has Mustard and the other one is Ketchup. Either way your dog will look fantastic showcasing the latest set of buns on the planet. For the dog that like to be the center of attention, this will assist with becoming the Mane event. Yes, pun was intended. This lion mane is a full headpiece. You will definitely want to take a second look to ensure that it is your dog and not a real lion. 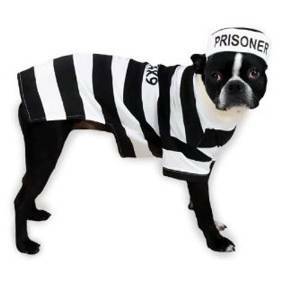 This costume includes a prisoner black and white striped shirt and matching hat. This is a very popular costume. Most people use this as a base for other items like Zombies or Valentine’s Day endeavors. Your pet is stealing your heart or you just can’t break him of a habit, this is a fantastic item to have in your costume closet. If you ever wanted to see what your pet would look like as a turtle – this is it. 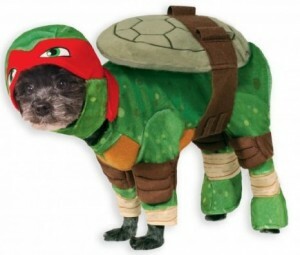 This is a full animal costume with a foam-looking turtle shell. This one is for Raphael. But the other Ninja Turtle costumes are available as well. This costume covers all four legs and has a partial mask. Your dog will be very warm in this customer – so this is a fantastic one to go around the neighborhood this Halloween. With the holidays coming on, you will need some elf-ish cheer. Don’t depending on that elf that sits on the shelf, bring on the one on all fours on the floor! This costume comes in multiple sizes with the following items: a hat, an elf shirt and anklets. There are no bells on this costume only red pom-poms. But this red and green outfit can be modified with a few bells so that you know what this mischievous pup might be up to. 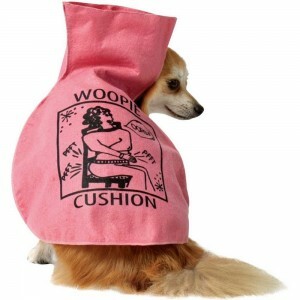 This costume has the dog wearing a very large fabric whoopee cushion. At this time, it does not make any sounds but it will bring laughter into any conversation. It looks exactly like the gag-gift just on a larger scale. Who could turn away such a jovial pup when it is wearing this costume! This is a gag gift that keeps on giving through the year. Definitely save this one for April Fools Day! It is amazing how a little bit of creativity can bolster the imagination. These 10 Best Dog Costumes are here to remind you of the classic, humorous and cult culture that is all around us. A little bandana or a full costume can start the imagination flying. It doesn’t have to be for one day a year. These could be used on a regular basis for Valentines, parades or just to bring a smile on a quiet day.